I have just returned from an amazing visit to Seoul to participate in the Bridges Conference. Bridges is an international organization that promotes the connections between Mathematics and Art, Music, Architecture, and Culture. This year the conference was a satellite conference for the huge International Congress of Mathematicians that took place in Seoul during the same week. This proximity enhanced our events by bringing numerous renowned Mathematicians (including Fields Medal winner Cedric Villani) to speak at the Bridges conference. One of the highlights of this conference is always the Art Exhibition. There was so much exciting work on display but I will only be able to discuss a small percentage in my blog. There is a type of computer assisted painting referred to as Ant Paintings in which points of pigment are deposited on a surface using an algorithm that determines when the pigment is picked up, where it is carried and where it is dropped. This process of “mobile automata” mimics the natural behavior of ants moving grains of sand. The completed paintings have an organic quality. Gary Greenfield has created a new series of work using this technique. He is the first artist to explore the incorporation of formulae into the algorithms in such a way that geometric shapes are formed in the painting. 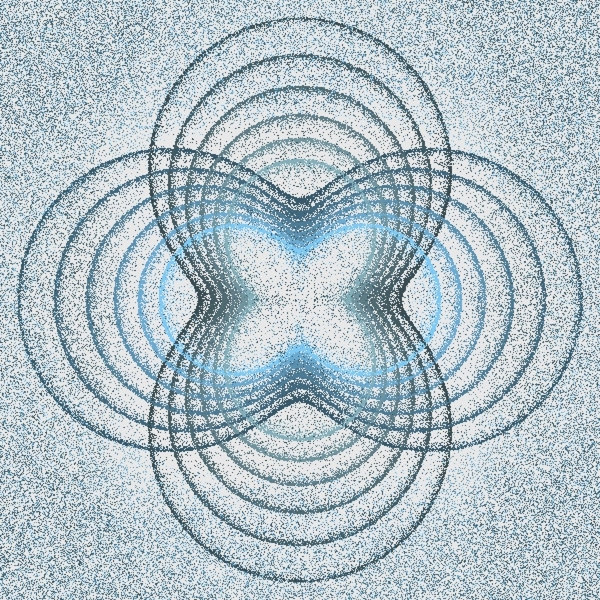 to determine where the pigment would be distributed The resulting image has order four rotational symmetry and a graceful use of concentric shapes, but what makes this work unique to me is its organic quality. There was one sculpture in the exhibition that I felt was a great visual representation of the whole conference. 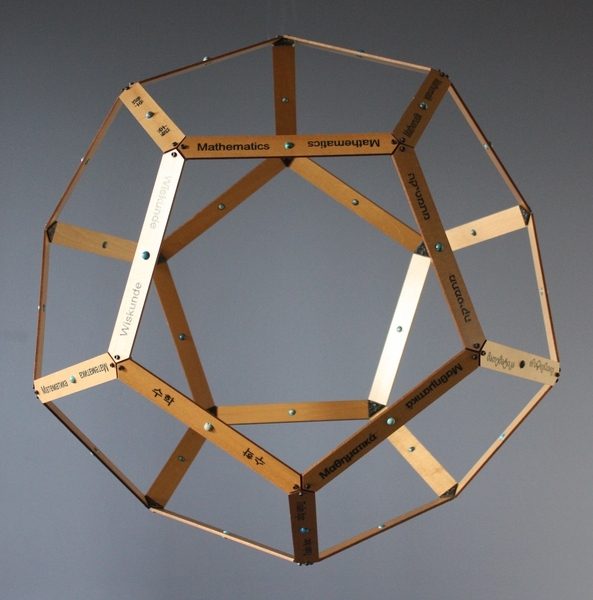 “Mathematics is Universal” is a wooden dodecahedral form by David Reimann. A regular dodecahedron is comprised of 12 regular pentagons (regular means all sides have the same measure), and 30 edges. The sculpture “Mathematics features the 30 edges of the dodecahedral form made out of wood strips. Each of the 30 strips has the word mathematics hand-painted in a different language. I feel this sculpture is a perfect metaphor for our conference. People from many cultures gathering to discuss the beauty and form of Mathematics. Some of the most abstract and gestural art on view was by the painter Suman Vaze. Her canvas “Ryoanji III” is an expression of the balance found in a 4 by 4 magic square. 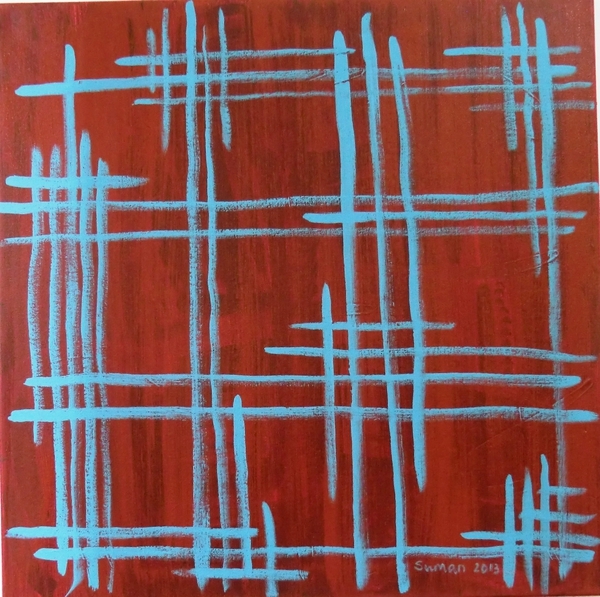 It is divided into a 4 by 4 invisible grid, and the number of horizontal and vertical lines going through a section of the canvas represents the number that would go in the corresponding square of the magic square. The particular magic square Vaze selected to depict in “Ryoanji III” is particularly well balanced each row and column adds up to 34 but each 2 by 2 square also adds up to 34. A nice Fibonacci number! These are just a few of the interesting works on display at Bridges. I will tell you about some more in my next post!